As regular readers of this blog know, Francis is into all things Judaic, especially Chasidism. 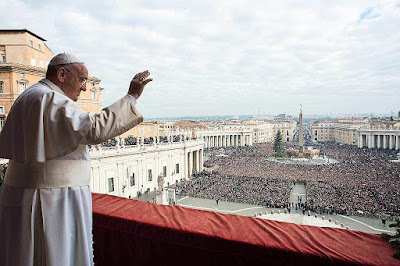 Their doctrines creep out here and there in Francis’ sermons and documents. One of the things which Francis does with regularity is to invert the teachings of the Church. An example of this is the use of the term ‘pharisee’ which he applies to his enemies, who are not open to Talmudic Judaism and Francis’ anti-Catholic machinations. Another example is his favorite blasphemous painting, White Crucifixion. Francis shows his hand, when he inverts Catholic doctrine, as a modernist change agent who is simply following the dictates of ‘The Rebbe’ to be, “modern on the outside and Chabad on the inside.” One of the most blatant examples is Francis teaching the Talmudic formula: Yeridah Tzorech Aliyah (“decent for sake of ascent”). This teaching simply means that one has to descend into sin, which paradoxically has a positive status in Hasidism, in order to ascend to new heights. This is done because the god of Talmudic Judaism is one of opposites — a hermaphrodite god of good/evil. In the Hasidic lore, tzaddiks (saints or righteous people) wrestle not with evil but with goodness as they descend into sin in this process in order to ascend into righteousness. Yeridah Tzorech Aliyah is one of the foundational beliefs of Orthodox Talmudic Judaism along with Tikun Olam. In the later belief the rabbis have the chutzpah to state that God made creation imperfect and the Talmudic Jews are to correct his work. The Hasidism of Francis’ mind is also shown when he says such things as, “[Jesus] made himself the devil” and “the Holy Trinity [is] arguing behind closed doors but on the outside they give the picture of unity.” Who else sees Jesus as a devil or God as a bunch of arguing rabbis other than a Talmudist? Whether he his parroting the ideas of Heschel, Levinas, Buber, Wiesel, a dead rebbe from the Steppes, or having over rabbis as guests who often gift him with books (Gluck & Steinsaltz) there’s an excellent chance it’s comes from the Baal Shem Tov and his cult in one manner or another. 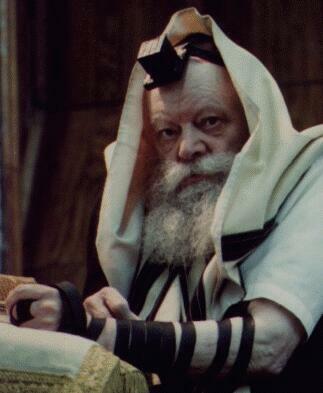 In the video clip below the late Chabad Lubavitcher rabbi, Menachem Mendel Schneerson, explains why Hasids should descend (into sin) in order to ascend — they are hunters getting ready to kill their prey. Another late Chasidic rabbi, Abraham Heschel (of Vatican II’s Nostra Aetate), in a 1965 interview with Ma'ariv explained exactly whom the prey were, “There are those who would like to attack [Christians] bodies. I want to attack their souls.” The elevation which takes place is one which will incorporate the prey’s soul into the of cult Talmudic Judaism and worship of their demonic hermaphrodite god. It’s a total inversion of Catholicism, the religion instituted by Jesus the Christ. So why is Francis teaching it? Christmas sher — a Chanukah carol — musical dialogue! The Church of Saint-Bernard-de-la-Chapelle located in the Goutte d'Or neighborhood of the 18th arrondissement of Paris celebrated the birth of Mohammed (Mawlid al-Nabi al-Sharif) along with the Institute of Islamic Cultures on 1 December 2017 by hosting a concert of Moslem songs in honor of Mohammed’s big day. The show was an alchemic mixing of a neo-gothic Catholic church and Moslem wailing. Listen to Francis? Nah, we’d rather shop. Not all is going well in the reign of the humble hasidic Francis. It’s becoming obvious to everyone that the crowds of worshiping fans are shrinking, even as the Vatican’s press office and their allies in the medias attempt to cover this fact up. There’s a myriad of excuses given — terrorism, global warming, people staying home to read Amoris Laetitia, increased security, cold weather, etc... This however is a trend that can no longer be hidden or excused away. Francis’ Christmas Message and Urbi et Orbi Blessing is just the latest example of the many recently that markedly demonstrate this. Thanks to CatholicSat who pointed this out on twitter with the two photos below. We at Call Me Jorge... wonder when the decline will turn into the fall? Joy to the world — A Savior is born! And it came to pass that when they were there, her days were accomplished, that she should be delivered. 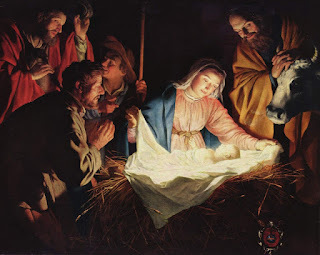 And she brought forth her first-born son, and wrapped him up in swaddling-clothes, and laid him in a manger: because there was no room for them in the inn. And there were in the same country shepherds, watching, and keeping the night-watches over their flock. And behold an Angel of the Lord stood by them, and the brightness of God shone round about them, and they feared with a great fear. And the Angel said to them: Fear not: for behold I bring you good tidings of great joy, that shall be to all the people: For this day is born to you a Saviour, who is Christ, the Lord, in the city of David. 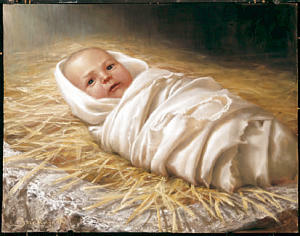 And this shall be a sign unto you: You shall find the infant wrapped in swaddling-clothes, and laid in a manger. And suddenly there was with the Angel a multitude of the heavenly host, praising God, and saying: Glory to God in the highest: and on earth, peace to men of good will. And it came to pass that after the Angels departed from them into heaven, the shepherds said one to another: Let us go over to Bethlehem, and let us see this word that is come to pass, which the Lord hath shewed to us. And they came with haste: and they found Mary and Joseph, and the infant lying in a manger. And seeing, they understood of the word that had been spoken to them concerning this child. And all that heard wondered: and at those things that were told them by the shepherds. 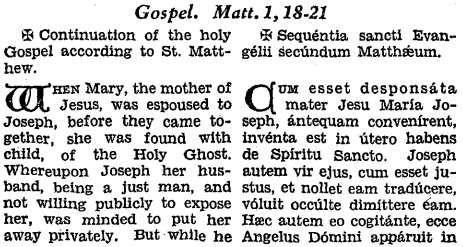 But Mary kept all these words, pondering them in her heart. And the shepherds returned, glorifying and praising God, for all the things they had heard, and seen, as it was told unto them. Prepare ye the way of the Lord, make straight His paths. songs and the Israeli national anthem “Hatikva” were sung. VATICAN CITY — Building on its ties with Israel and its effort to reconcile Roman Catholics and Jews, the Vatican celebrated Hanukkah for the first time Tuesday, lighting a candle in a sheltered garden where popes have strolled for centuries. "There is much darkness in the world around us. There is much need of light," declared Cardinal Edward Cassidy before lighting the candle on Pope John Paul II's behalf, shielded from a late afternoon drizzle by an aide holding an umbrella. 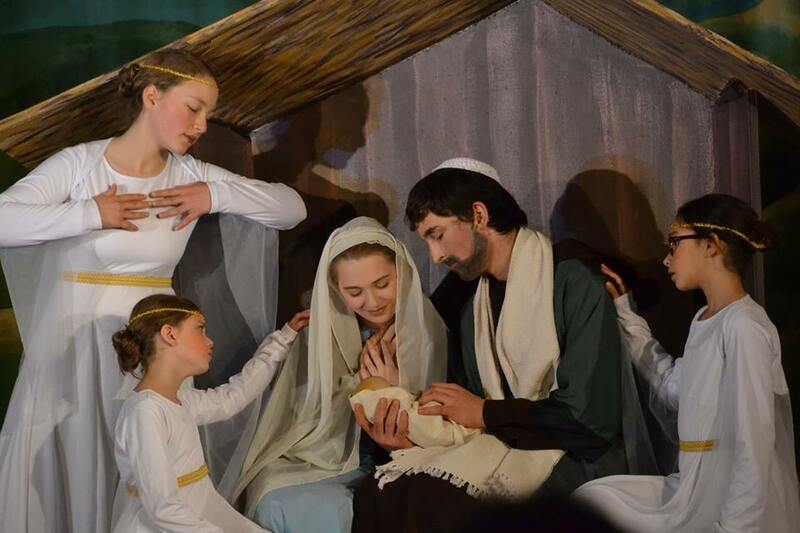 "It is our hope that these celebrations will bring much joy to the people of Israel, light to those who govern the state and peace to all who live within its borders," the Australian cardinal added. Hanukkah is the eight-day Jewish Festival of Lights, and this year it officially launches a year of commemorations of Israel's 50th anniversary as a state. Israeli officials said the leaders of 33 nations, including the United States, also heeded their appeal to light Hanukkah candles Tuesday in honor of the anniversary. In his Hanukkah message, President Clinton offered optimism for prospects in the Middle East and said, "May the candles of the menorah light our way to a true and lasting peace." The Italian government, in an act of atonement, held its Hanukkah ceremony under Rome's Arch of Titus, built to celebrate the Roman Empire's destruction of the Jewish Temple in Jerusalem in AD 70. Italian Prime Minister Romano Prodi used the event to urge Israel to resume peace talks with the Palestinians. But of all the worldwide celebrations, the one here near the brick embattlement that enclosed the Vatican in the 9th century was arguably the most poignant. It was blessed by a pope who has done more than any predecessor to rid his church of anti-Semitism but still faces criticism for not doing enough. "This is an important chapter in that historic process of reconciliation," Aharon Lopez, Israel's ambassador to the Holy See, told a small gathering of dignitaries in the Vatican Gardens. Hanukkah marks the victory by a small band of Jewish fighters 2,161 years ago over the Greco-Syrian kingdom, which had tried to impose its culture and adorn the Jewish Temple with statues of Greek gods. According to legend, when the Jews tried to rekindle the temple's eternal flame, they found what they thought was enough oil for just one day. Instead, it lasted eight days. Jews celebrate the legend by lighting one candle on each of eight evenings on a ceremonial candelabra, or menorah, placed on windowsills in their homes. 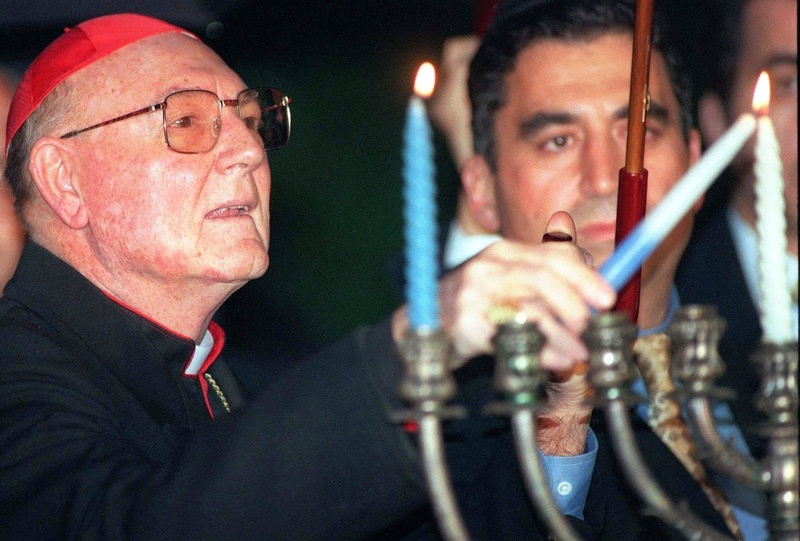 Cassidy, head of the Vatican commission for relations with Jews, called the battle celebrated at Hanukkah "a victory of principle over compromise, of faith over power, of truth and sound moral living over the dazzling and seductive attractions of a wealthy and mighty empire, of the true God over false imitations of the divinity. "These are values that Jews and Christians can and should share," he added. The cardinal lighted a menorah that was borrowed from the Jewish Museum of Rome and set on a table by an olive tree. 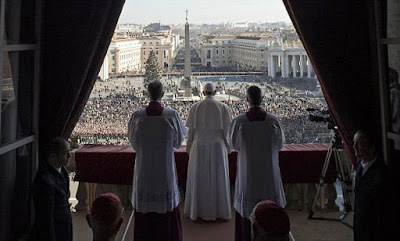 The tree was first planted in Jerusalem in 1965 to mark a retreat from the historic animosity between Catholics and Jews--the Second Vatican Council's declaration that Jews cannot be held responsible for the crucifixion of Jesus Christ. In June 1995, the tree was replanted in the Vatican Gardens as a symbol of Vatican-Israeli diplomatic relations, established 18 months earlier. Those ties were strengthened last month with an agreement placing Roman Catholic institutions in Israel under jurisdiction of Israeli law--a move that will make it easier for the church to acquire property there. Since the start of his papacy in 1978, John Paul has reached out in other ways to Jews. On a visit to the site of the Nazi death camp at Auschwitz, he called the Holocaust the "Golgotha of our century." In Rome in 1986, he became the first pope to visit a synagogue. And last month he declared that certain erroneous interpretations of the New Testament had fueled centuries of hostility toward Jews, to the point of numbing many Christians into passivity when they should have been resisting the Nazis' systematic slaughter of Jews across Europe. "Our parents could certainly never have imagined that so much progress could have been made in [Catholic-Jewish] relations in such a short time after so many centuries of misunderstanding," said Tullia Zevi, president of the Union of Italian Jewish Communities, adding that she was "overjoyed and moved" by Tuesday's candle lighting. But Zevi was quick to point out, in remarks to reporters, that Jewish leaders still expect a Vatican apology for its own silence during the Holocaust. The Holocaust was not mentioned in Tuesday's speeches here--by Cassidy and Msgr. Jean-Louis Tauran, the Vatican foreign minister, and by Israeli Deputy Prime Minister Moshe Katzav. Neither did they discuss recent recriminations by some Jews against the Vatican for its alleged secrecy about its possible role in handling Nazi gold. Instead, each side congratulated the other for its ecumenical spirit. Unwrapping a Hanukkah gift from the Israelis, Cassidy found a brass menorah and admitted never having used one. He said he first realized he wanted one when Lindy Boggs, the new U.S. ambassador to the Holy See, arrived last week with hers--awarded seven years ago by New Orleans Jewish women for her ecumenical work. "I was jealous of Lindy Boggs," the cardinal said. "I thought, 'That's very unpleasant for me, being in charge of relations with Jews and not having a candle stand.' Now I'm very grateful to have one." Chanukah was ushered in in Rome this year with two unprecedented menorah-lighting ceremonies — one at the Vatican and one at the ancient Roman arch that is the symbol of the Jewish Diaspora. After Rome’s Chief Rabbi Elio Toaff chanted the blessings, Italian President Oscar Luigi Scalfaro lit the first candle of a huge menorah set up underneath the Arch of Titus in the Roman Forum, near the Colosseum. The arch was built to celebrate the Roman victory over the Jews and the destruction of the Temple in Jerusalem in 70 C.E. On its inner side it has a carving showing the menorah from the Temple being carried by Jews brought to Rome as slaves. That carving is one of the most infamous images in Jewish history — so much so that for centuries Jews would not walk through the arch. The menorah as shown, however, was the basis for the one that became the symbol of the State of Israel. The ceremony at the arch, organized by the Israeli Embassy in conjunction with Italian authorities, was an hourlong extravaganza that marked not only the beginning of Chanukah, but also kicked off celebrations that will take place during the coming year to mark the 50th anniversary of Israel. Italy’s political elite took part in the ceremony, which drew a crowd of hundreds, most of them members of the 15,000-strong Roman Jewish community. Two hours earlier, just after sunset, Vatican, Israeli and Italian Jewish representatives lit a 2-foot-high silver menorah, on loan from the Rome Jewish Museum, in the Vatican garden. The lighting, the first time that a Chanukah candle was kindled at the Vatican, also was aimed at celebrating the 50th anniversary of Israel’s founding. The ceremony took place next to an olive tree that was planted there in 1995 to mark the first anniversary of diplomatic ties between the Vatican and Israel. The Vatican delegation was led by Cardinal Edward Idris Cassidy, president of the Pontifical Commission for Religious Relations with the Jews, who lit the candle as the personal representative of Pope John Paul II. Cassidy praised the development of Jewish-Catholic relations since the historic Nostra Aestate declaration of 1965. “It is because of our common heritage and values as faith communities that we have come together here this evening,” he said before lighting the candle. “There is much darkness in the world in which we live,” he said, expressing the hope that light and peace would prevail. 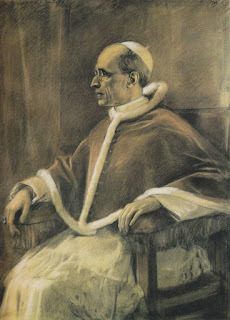 The past anti-Semitism of the Catholic Church, as well as the Vatican role’s during the Holocaust era, has long been a subject of controversy. The latest development came earlier this month, when the Vatican denied it had stored money and gold for Croatian fascists after World War II. 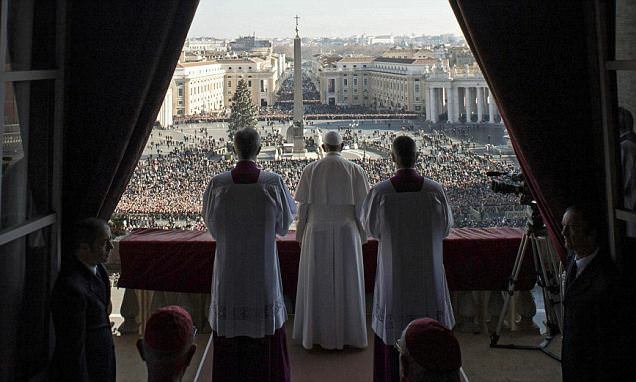 A Vatican spokesman rejected calls for the Holy See to open its archives from that period. source: The Restoration of Israel: Christian Zionism in Religion, Literature, and Politics, p. 179. 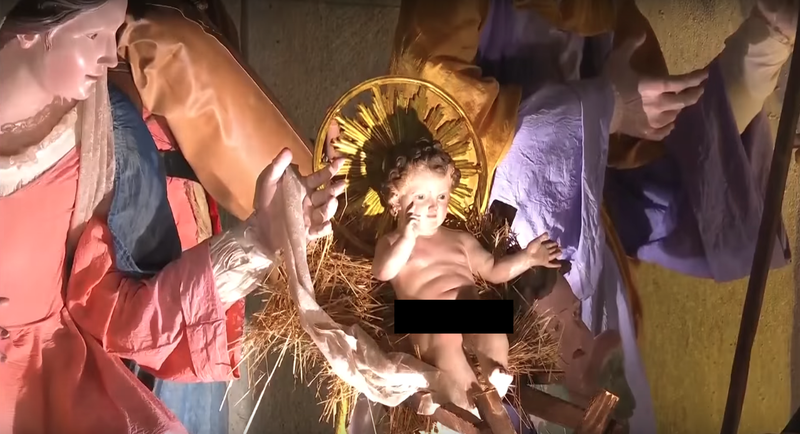 Why is this Nativity scene blasphemous? We will explain why this image isn’t wholesome but is in fact blasphemous and heretical. It cannot be said positively when the zucchetto became customary, but it was probably not before the thirteenth century. It appears on the cardinals in the fresco, "St. Francis before Honorius III", painted about 1290 in the upper church of St. Francis at Assisi. It is seen also under the tiara in the effigy on the tomb of Clement VI (d. 1352) at La Chaise-Dieu. The figures on the several tombs of bishops of the fifteenth century in the Roman churches show the zucchetto under the mitre. In the "Ordo" of Jacobus Gajetanus (about 1311) the zucchetto is mentioned in connection with the hat of the cardinals (cap. 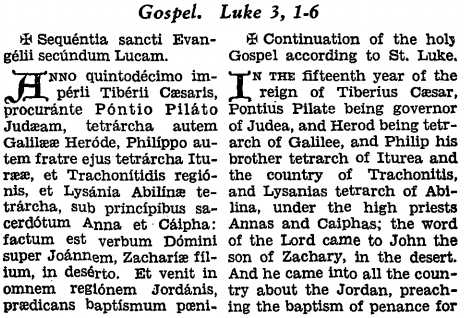 cxviii), and with the mitre in the "Ordo" of Petrus Amelii (cap. cxliv. ), which appeared about 1400. It is shown in the pictures and sculpture of the late Middle Ages sometimes as a round skullcap, sometimes as a cap that covers the back of the head and the ears. In this shape it was called camauro; this designation was given especially to the red velvet cap of this kind bordered with ermine that was peculiar to the pope. 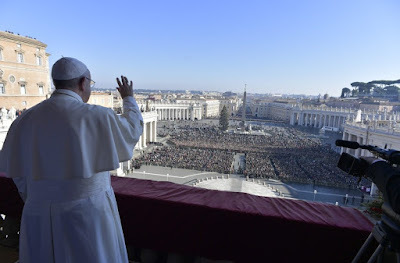 There was great confusion as to the proper use of the zucchetto and hence the Sacred Congregation of Rites has delivered several decisions on the Subject ("Decr. auth. Congr. SS. Rit. ", V, Rome 1901, 382). A sketch of Pope Pius XII wearing a white zucchetto. 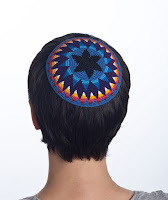 “The Taz says even though mi’ikkur hadin, it’s not a chiyuv to wear a kippa, this is “bechokoseyhem lo teilecho” since the goyim take off their headcovering, we should not do the same. To be bareheaded is an issue of “bechukoseyhem lo teilecho”. source: Judaism Discovered, From Its Own Texts: A Study of the Anti-Biblical Religion of Racism, Self-Worship, Superstition and Deceit, p. 591. Jews wearing kippot as not to be identified as with the cursed nations (Catholics). source: Daf Yomi Digest, Friday 31 May 2013, Halachah Highlight, p. 2. “In a recent book on the halakhic force of customs, Imrei Barukh: Tokef Ha-Minhag Ba-Halakhah, Rav Baruch Simon addresses this question. One reason for various customs is the biblical prohibition against following the practices of other religions (chukos ha-goyim). Following the Jews’ emancipation, this prohibition became a dominant theme in the complex integration of Jews into Christian society–what are we allowed to do and what is off limits? Prior to that, Rav Shlomo Luria (Responsa Maharshal, no. 72) concluded that wearing a yarmulke is only a custom, not a law. The Vilna Gaon (Bi’ur Ha-Gra, Orach Chaim 8:6) ruled that you are not even obligated to wear a yarmulke while you pray. However, the Taz (Orach Chaim 8:3) added the consideration of chukos ha-goyim. Since Christians would regularly remove their head coverings, particularly before praying, Jews may not follow this practice. According to the Taz, sitting without a yarmulke–and certainly praying bareheaded–is biblically prohibited. “The Torah Temimah, on this verse, cites the words of the Shulchan Aruch and he raises a question. The Shulchan Aruch writes that one should not enter a shul “with a long knife or with an uncovered head”. The simple reading of the Shulchan Aruch seems to suggest that there are two entirely different topics being discussed: firstly, one should not enter a shul with a weapon and secondly one should not enter without properly covering one’s head (yarmulka). The Torah Temimah wonders what connection there is between these two statements. What’s more the Shulchan Aruch already discussed the hallacha of praying without a head covering in siman 91, why then would he feel compelled to repeat himself? economically or if they are in a Noahide compliant country. Young boys should be trained from a very early age to wear a Kipah on their heads, as the Talmud (Shabbos 156b) teaches that covering the head leads one to fear Hashem. However, before determining this, especially nowadays when it is acceptable almost everywhere to wear a Kipah (due to the kindness of Hashem that most of us live with religious freedom and tolerance), a competent Halachic authority must be consulted. 1) A MALE WHO DAVENS WITH A BARE HEAD, EVEN B'SHOGEG, UNINTENTIONALLY, ACCORDING TO HARAV MOSHE FEINSTEIN ZATZAL (IGROS MOSHE ORACH CHAIM VOL. 4 SIMAN 40:14) MUST DAVEN AGAIN, AS HE HASN'T SATISFIED HIS OBLIGATION, EVEN B'DIEVED. HE WRITES THERE THAT THIS TEFILAH IS DEEMED "TOEVA", AN ABOMINATION. HARAV SHLOMO ZALMEN AUERBACH ZATZAL (HALICHOS SHLOMO; TEFILAH, PEREK 2:16) RULES MORE LENIENTLY, AND MAINTAINS THAT IF IT WAS DONE UNINTENTIONALLY, B'DIEVED HE HAS SATISFIED HIS OBLIGATION AND DOES NOT NEED TO DAVEN OVER. The Rambam prohibits praying the shemoneh esrei bareheaded (Hilchos Tefillah 5:5), and he also states that it is appropriate for a talmid chacham to cover his head at all times (Hilchos Dei’os 5:6). 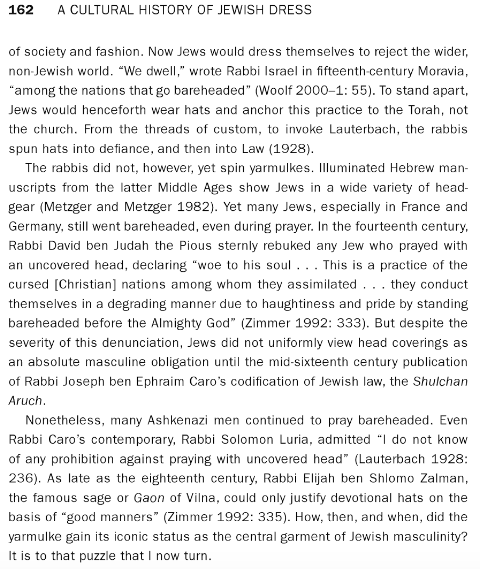 Based on the above sources, most, but not all, halachic authorities contend that, in Talmudic times, covering one’s head was performed on special occasions, such as when praying, reciting blessings, and in the presence of a Torah scholar, but was not always otherwise observed (Tur, Orach Chayim 8, as explained by Darkei Moshe; Shu”t Maharshal #72; Gra on Orach Chayim 8:2). These rulings imply that someone other than a talmid chacham is not required to cover his head, except when davening. As we will soon see, most authorities conclude that, today, one is required to cover one’s head, because of reasons that did not apply in the time of the Gemara. Some authorities note that the Taz’s reason should apply only in western countries and other places where the gentiles have a specific practice to uncover their heads. However, in places where the gentiles have no such concerns, such as in Moslem countries, there is no prohibition of chukos akum in leaving one’s head uncovered (Shu”t Igros Moshe, Orach Chayim 1:1). It may still be prohibited because of Jewish custom. 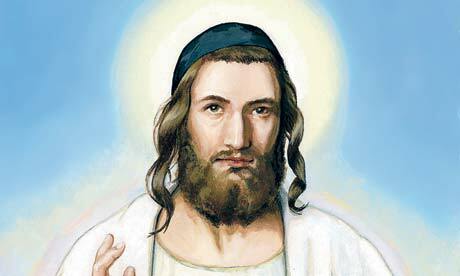 Jesus never would have worn a kippah as Hebrew-catholics are wont to portray him. source: Judaism Discovered, From Its Own Texts: A Study of the Anti-Biblical Religion of Racism, Self-Worship, Superstition and Deceit, pp. 591-2. To which we would only add that Jews are not obligated to wear a kippah (yarmulke) when in a Moslem country. The reason for this is because Moslems pray to the same god as the Jews and are Noahide compliant while Catholics are considered idol worshipers by the Talmudists. Returning to the first photo of this post of the Nativity scene with St. Joseph wearing a kippah, we now hope that the reader understands how not only is this blasphemous, it is also heretical and an occult mockery of Our Lord’s birth. 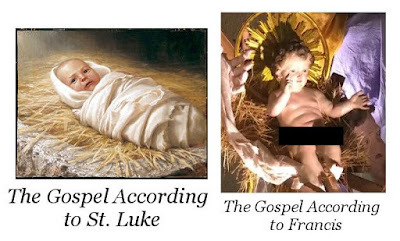 It, like Francis’ Vatican Nativity, is dangerous because they are poisons disguised as medicines for the soul.